Venography is an x-ray test used to study the veins of the body. 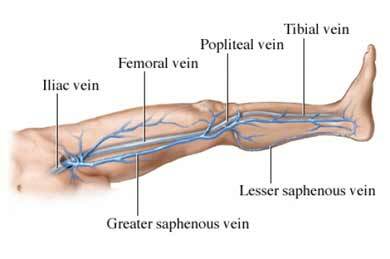 Lower leg venography is used to study the veins in the legs. People with kidney problems or diabetes, especially those taking metformin, may have a higher risk for complications from venography. You may be asked to fast or drink only clear fluids for 4 hours before the test. Tell your doctor if you have a history of allergies, or bad reactions to injected contrast. If you are nervous about the test, your doctor may give you a sedative. You will lie on a tilting x-ray table. You will be cleaned in the area where the catheter will be inserted. A small cut in your skin may be made in that area as well. You may be given a local anesthetic to numb the area where the catheter will be inserted. The catheter is inserted into your vein and the contrast is slowly injected. A tight band may be tied around your ankle or your lower body may be tilted. This helps to fill the veins with contrast. You will be asked to remain still as the doctor uses an x-ray machine to view the movement of the contrast through your veins. When you get home from the test, take it easy for the rest of the day and try to avoid any strenuous activity. Drink large amounts of fluid for the next 24 hours to help flush the remaining contrast from your body. You may remove the bandage the day after your test. Observe the injection site for any swelling, heat, redness, pain, or drainage. The injection area may be sore for a few days. If any bleeding or swelling occurs at the injection or puncture site, put pressure on the site for at least 10 minutes. Most people are able to return to normal activities the day after the test. The test takes about 30 minutes. This may be longer depending on the specifics of the test. You may feel some pain at the injection site during the test and soreness for a few days after. Some people feel mild discomfort throughout the body, or nausea as the contrast fills the veins. A normal venography means that the blood flow through the vein is normal. An abnormal venography means that there is something blocking blood flow through the vein. Based on the results, your doctor will discuss further studies or treatment. Venogram. Johns Hopkins Medicine website. Available at: https://www.hopkinsmedicine.org/healthlibrary/test%5Fprocedures/cardiovascular/venogram%5F92,P08295. Accessed March 1, 2018. Venography. Radiology Info—Radiologic Society of North America website. Available at: https://www.radiologyinfo.org/en/info.cfm?pg=venography. Updated May 1, 2017. Accessed March 1, 2018.